In this video, we are going to talk about scoring on the GRE. This is a big question. What is the score range? What is the score I want to get? So this is a great place to start. First off the range is very different. From 130-170 for each section. So Math is 130 to 170. As is verbal. So it's actually 260 composite is the lowest you can get. And 340 is the highest. With 300 being in the middle. So good thing to know. Composite is 340, but oftentimes people speak in terms of their scores per section. Finally, there's the essay which is graded from a 0.0 to a 6.0. So again, quite a range, you definitely don't want to get a zero. 6.0 is something that's very difficult to achieve. Only the top of test takers are able to do so. So definitely quite a summit to and for as far as the old scale goes. And why am I even mentioning the old scale now that I've gone through the new scale? Well, some of you may have taken the GRE before it changed in August 2011. And you're wondering should I take the new GRE? Is my score good enough? How long is it valid for? Or even if you're oretty certain your going to take the new GRE. You just want to see how you stack up against your old score. Old score was based on 200 to 800. That was for both the Math and verbal sections. You actually had a composite of 1600. But the score you got. Say you got 1,250. That score is valid 'til 2016. So if you go back there and you say, "Well, I got my 1250." 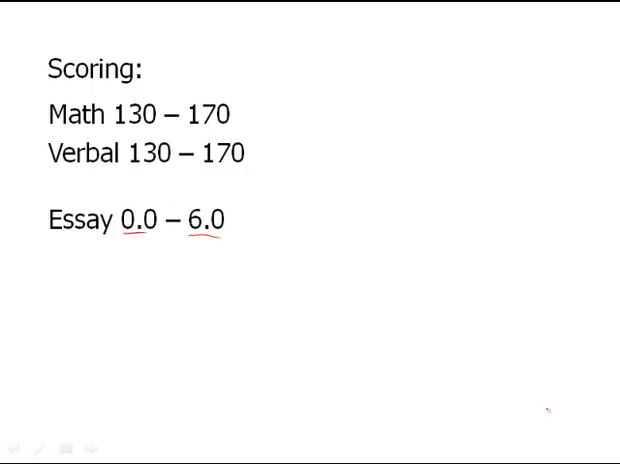 Again, 200-800 for both math and verbal. You want to see how good is that score. What do I need to get on the new GRE? Well great place to find out that information is on the ETS site. So, I highly encourage you to go there. Just to see how you did on the old test. And what you need to do. What score you need to achieve on the new GRE.